Savio Livingponds Filters mimic natural filtration in living eco-systems. A built-in settling chamber with a bottom drain makes maintenance easy by collecting solids before they pass through the media. 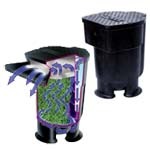 The main filter chamber, loaded with easy to clean, non-clogging Savio Springflo Bio-Filter Media, effectively removes solids from the water column and provides maximum surface area for beneficial bacteria. The Livingponds Waterfall Filter F100 includes a 22" weir while the Versatile F200 a 2" discharge. Superior water quality, simplified plumbing and maintenance. Complete filtration for ponds up to 5,000 gallons with less maintenance.